The Wright State University's College of Education and Health Services (CEHS) is in the process of proposing a new master’s degree program in athletic training (AT). As a result, the athletic training program is no longer accepting applications for undergraduate admission. The initial class is anticipated to begin in the Summer of 2020 culminating in a Master’s of Science degree in Athletic Training (MSAT) as specified by the Commission on Accreditation of Athletic Training Education (CAATE). In 2015, the National Athletic Trainers’ Association (NATA) Strategic Alliance established the professional degree in AT at the master’s level. Institutions wishing to establish an entry-level, graduate AT program (GATP) must do so by 2022. Wright State AT Program was initially accredited in 2002 and has a long history of producing excellent athletic training professionals. 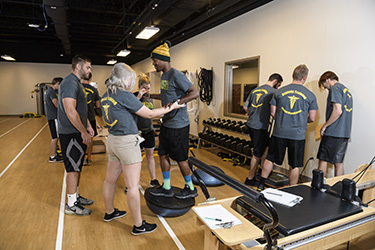 Wright State University Athletic Training Program is accredited by the Commission on Accreditation of Athletic Training Education (CAATE), located at 6850 Austin Center Blvd., Suite 100, Austin, Texas 78731-3184. The program will have its next comprehensive review during the 2026-2027 academic year. Rebekah Bower, M.S., A.T., A.T.C. View Bachelor of Science in Athletic Training program information and degree requirements in the University Catalog. 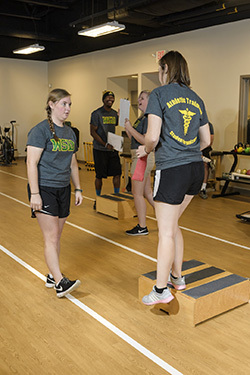 The mission of the Wright State University Athletic Training Program is to educate students in the domains of athletic training, preparing them to assume the role of a healthcare professional in a variety of employment settings and to optimize the quality of healthcare provided to patients of all ages and physical capabilities, thereby maximizing their health-related quality of life. GOAL 1: AT Program faculty will be highly qualified and professionally diverse role models who exemplify excellence in teaching, scholarship, and service in order to provide comprehensive educational experiences for students. 2017-2018 Assessment: Achieved all objectives except a few “neutral” or “somewhat disagree” ratings on course evaluations primarily related to course materials and motivation to learn about a particular subject. However, faculty members have reviewed texts utilized for the ATP courses and have made changes for the upcoming year. GOAL 2: Athletic training graduates will be prepared to pass the Board of Certification (BOC) exam and become entry-level athletic trainers. 2017-2018 Assessment: Achieved all objectives (i.e. preceptor evaluations, exit and alumni survey data) except did not meet benchmark “80% of AT Program graduates will pass the BOC on the first attempt”. This year 14/21 (67%) of the 2017-2018 graduates passed on the first attempt. However, upon re-examination 18/21 (86%) have passed the exam. ATP Faculty have met and established several new practices and resources for 2018-2019 (ie. multiple mock exams & new online resource with testlets) to address this concern and increase first time pass rate. GOAL 3: AT Program preceptors will be highly qualified professional role models who exemplify excellence in clinical practice. 2017-2018 Assessment: Achieved all objectives. GOAL 4: The AT Program will provide opportunities for high-quality clinical education at diverse, safe, and professional affiliated sites. GOAL 5: Athletic training students will participate in activities that will contribute to their professional development and the advancement of the field of athletic training. 2017-2018 Assessment: Achieved all objectives in each of the content areas with minimal concerns. AT Faculty have developed strategies to address these concerns in the up-coming academic year. ATP students will be able to synthesize and integrate knowledge, skills, and clinical decision-making into actual patient care. 2017-2018 Assessment: The 2017-2018 graduates completed all nine (9) of the Clinicial Integration Proficiencies (CIPs). In addition, all underclassmen are making satisfactory progress. *The WSU ATP retention and graduation rates appear lower than anticipated because students can be admitted directly from high school into the program. This results in lower retention and graduation rates than programs which only admit upperclassmen. **Students who enter the WSU ATP as upperclassmen finish the program requirements and graduate at the end of July each year. Therefore, the data listed above is only 2-months post-graduation versus the national norm for this data of 6-months post-graduation. Siobhan E. Fagan, M.Ed., A.T., A.T.C.